Posted on Wed, Feb 8, 2012 : 5:59 a.m.
Ann Arbor's elementary schools should have the building capacity to start all-day kindergarten in the district next school year, the director of the district's physical properties says. “(The data) tells me generally there are no buildings that, by capacity, jump out and say, ‘You’ve got a problem,’” said Randy Trent, executive director of physical properties for Ann Arbor Public Schools. Some officials were originally concerned about capacity and whether the district could hold more sections of all-day kindergarten, since each half-day class would need its own classroom under a full-day program. 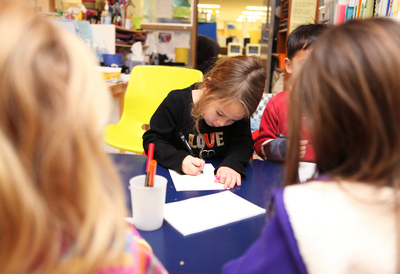 Kindergartner Naya Loftus draws a picture during class at Lakewood Elementary School in December. Ann Arbor Public Schools is getting closer to deciding whether it will implement all-day kindergarten in 2012-2013. AAPS has been weighing district-wide all-day kindergarten for a number of years. It conducted a review of building capacities and classroom use two years ago and went through a similar process recently. A recommendation about proceeding with all-day kindergarten is expected to come before the board this month. A number of factors will contribute to the district’s final decision. Effective Oct. 1, the start of the state’s fiscal year, a new Michigan law will require districts to provide all-day kindergarten in order to receive the full per-pupil funding allotment for each kindergarten student. Other factors the district will consider in making its decision are transportation changes required for all-day kindergarten and total cost to the district, an approximate $2 million, according to a Jan. 24 school board discussion. Because of the state-wide mandate, Dexter Community Schools and Saline Area Schools recently started all-day programs. Milan also is expected to make the switch this week. Ann Arbor and Whitmore Lake are the only two districts in Washtenaw County to retain mostly half-day options. Reserved rooms are defined by AAPS as non-classrooms and rooms used for special education, early childhood education, computer labs, media centers, art or music classes, staff break rooms or health and social services, etc. The district will need to determine which of these rooms need to have their uses altered in order to accommodate all-day kindergarten. “And what does that mean for students and what does that do to that building?” he said. Spokeswoman Liz Margolis said the district is evaluating and speculating about what moves will cause the least disruption to buildings. She said this lengthy assessment process takes time. “It is not a cookie cutter approach,” she said. 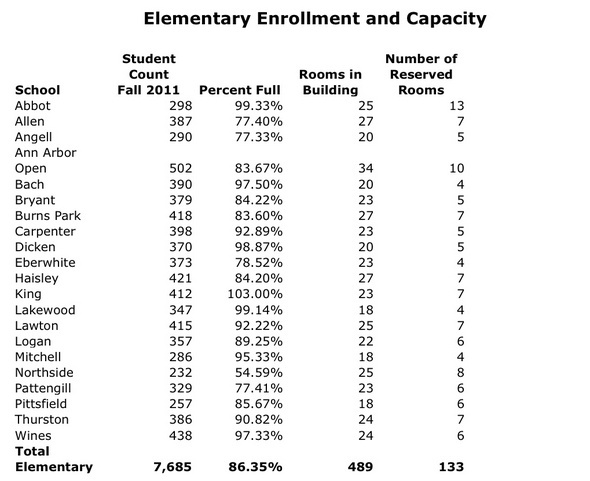 Abbot Elementary School has the greatest number of reserved rooms, according to recent capacity data obtained by AnnArbor.com. But it also is operating at a current student-capacity rate of about 99 percent, data shows. Margolis said part of the reason Abbot has so many reserved rooms is Abbot houses the district’s Young 5’s program. Trent said schools with fewer — four or five — reserved rooms have less space with which to work. The district has reduced the number of elementary reserved rooms throughout the past few years as it worked to balance the budget. Those schools that once had two music rooms or two reading intervention rooms, likely now have just one, he said. Trent said the district may need to make some tough choices to possibly move a program at one of these tighter schools to another building. Margolis said switching to a district-wide all-day program could change enrollment numbers at the elementaries. She said right now, parents in an elementary neighborhood without full-day kindergarten might elect to send their child to a school with the full-day option. But if all of the schools equally offered full-day kindergarten, then the parents likely would return their child to their home school, she said. She added the secret to making all-day kindergarten work will be different at each building. Kindergarten enrollment also just began, so the district will not know exactly what must be done until it has a better idea of the numbers, Margolis said. Fri, Feb 10, 2012 : 8:10 p.m. Wed, Feb 8, 2012 : 10:26 p.m. If you provide all your own child care, or in other words, you stay home with your kid, you certainly do not need or want all day kindergarten. I can teach my kid better at home, thank you. I don't need the public schools. Already by first grade they are in school all day anyway. This is for the teachers and schools, more jobs and more money for them. It's not for the children. I stay home with my kids, and I still think full day kindergarten is the right choice for my daughter - and it's not because I'm not capable of teaching her better at home, far from it. Different strokes for different folks. Ideally all schools would offer both full day and half day kindergarten and parents could choose what is right for their individual child. Thu, Feb 9, 2012 : 12:46 p.m.
How do the teachers benefit? Thu, Feb 9, 2012 : 2:43 a.m.
You have been out of touch with real schools apparently! Wed, Feb 8, 2012 : 7:39 p.m. The most important change that needs to be made with regard to kindergarten in AAPS is equal access to equal programming. If some schools have free all day kindergarten, ALL schools should have free all day kindergarten - and that is not the case now at all. I'm surprised that the community hasn't made a bigger stink about this sooner, honestly. Fri, Feb 10, 2012 : 2:53 a.m. Beyond kindergarten inequalities are the differences seen from building to building. Some of the schools are able to raise a lot of money from fundraisers because the parents can afford to support the students by buying or know people who can buy for the fundraiser. One elementary has all 5th graders go to Space Camp. All of the students would benefit from an awesome experience like this. The differences are huge as you look through all of the buildings. Thu, Feb 9, 2012 : 1:23 p.m.
@Beth - I really, really wanted to protest loudly at this time last year when we were getting ready to enroll our daughter in kindergarten, but I did not want our family to be labeled &quot;trouble makers&quot; right out of the gate before my first child had even started school. I often regret that decision. @Sarah - I've been amazed by this inequity, too, and by the fact that more parents at schools without free all-day K haven't risen up to protest. There are so many differences between schools that I find unbelievable - not just in respect to all-day K but to other issues, too, at all levels. We all pay taxes to AAPS, and there are &quot;rich&quot; and &quot;poor&quot; families at all schools. We should all have equal opportunities for our kids, yet this is definitely not the case. This ties into the discussion a few days ago about Scarlett vs. the other middle schools - again, lots of discrepancies. Wed, Feb 8, 2012 : 6:57 p.m.
@jcj: I have a three year and three month old son and a seven month old daughter. I had some great teachers and great schools and some truly awful ones that would make you cry to hear what terrible things happened inside them. I want the former for my children, and everyone else's too, not the latter! It would be interesting to know how many that are commenting here: a) Have children in kindergarten this year. b) Will have children in kindergarten next year. c) Have had children in kindergarten. d) Have NEVER had children. Wed, Feb 8, 2012 : 8:41 p.m.
Just for the record my children have long since left kindergarten and I have 2 grandchildren that have been through kindergarten and one in kindergarten. Wed, Feb 8, 2012 : 7:43 p.m. I have a child in kindergarten in AAPS, in an EDO program. Having her in a full day program was important to us because she was in full time center-based daycare her whole life, and thrived there. It was important enough to us that we shelled out for EDO at our neighborhood school even though I am not currently working (I left my job right before she started kindergarten.) It really ticks me off that if we lived a few miles over, she could have a full day experience for free. Wed, Feb 8, 2012 : 6:38 p.m. I have a child in kindergarten this year. She is not at school in her home district (Dexter) because they did not offer full day kindergarten. She will begin in Dexter when the students go to the next building (3rd grade in Dexter). My older son is in Dexter and the 3 year old wil go to Dexter for kindergarten because the will be offering full day, tuition free kindergarten. Wed, Feb 8, 2012 : 4:32 p.m. In coordination with moving to full day kindergarten, the date for starting kindergarten should also be changed. Currently in Michigan, a child must be 5 on or before December 1 to start kindergarten. Most states require children to be 5 on or before September 1. 4 is just too young - it may not show up as too young in kindergarten, but by 4th grade many of those younger kids are struggling. I hope the AAPS all day kindergarten model follows the current EDO model: academics in the a.m. followed by &quot;play&quot; that reinforces what the children learned in the morning. AAPS has some EXCELLENT kindergarten teachers to model from and I hope they use these teachers as resources! Wed, Feb 8, 2012 : 6:36 p.m. I completely agree with students being 5 when they begin kindergarten. 3 months makes a lot of difference in the early years. Here a a list of cut off dates to begin kindergarten. <a href="http://users.stargate.net/~cokids/kindergarten_cut-off_dates.htm" rel='nofollow'>http://users.stargate.net/~cokids/kindergarten_cut-off_dates.htm</a> The majority are much earlier than the December 1st cut off in Michigan. It would be interesting to see how students do with the curriculum of 'today' in the states that have the earlier cut off for entering kindergarten. Wed, Feb 8, 2012 : 4:49 p.m. There already is an &quot;AAPS all day kindergarten model&quot;, at the 6 elementaries that have been offering only all-day K for several years. Academics are spread out throughout the day, with more chances to do things like art projects or extended centers time. The pace feels slower and more relaxed than in a half-day classroom. Students also enjoy more time in special area classes. Wed, Feb 8, 2012 : 4:18 p.m.
China and India laugh at our short school days and years. Wed, Feb 8, 2012 : 10:33 p.m.
Who cares what China and India think of us? Wed, Feb 8, 2012 : 3:56 p.m. I'm so tired of A2 parents complaining about the smallest of things in comparison to reality. Kids in A2 are already sheltered and babied so much compared to the world outside of A2. Quit making excuses as to why a couple of more hours of education would be detrimental, and think about the positive things. The positive things socially and academically. In an academic setting vs being with a babysitter. With peers and adults pushing for social success vs at home with &quot;stay at home mom.&quot; My son is in all day kindergarten in a city outside of Ann Arbor and he's doing well, plus other activities throughout the week. There may be some kids who all day Kindergarten wont work for. Maybe the option should still be available for half days, but I definitely am in favor of all day Kindergarten being an option at every school. Wed, Feb 8, 2012 : 3:36 p.m. I'm not sure if I would have enjoyed kindergarten as much if it had been a full day when I was in school. We had more time for recess and even a nap time included in my schedule. Kindergartners these days do not get that. They have to learn alot more than most of us did when we started school. Things such as math, which pretty much did not come into existence until I was in 1st grade. With the new requirements, maybe it does make sense. Wed, Feb 8, 2012 : 6:46 p.m.
Actually, my kindergartner, in a full day program, has three recesses, two story times, snack, lunch, and a rest time. They also don't have any academic expectations greater than what the students in half-day programs have -- they just have more time to go over the concepts. Wed, Feb 8, 2012 : 3:18 p.m. The result will be that more parents who can afford daycare or who stay home (wealthier families) will hold their kids back a year so they can better handle the full day academic setting. You'll then have a larger age range of kids in each grade, with the wealthier kids being older, stronger, smarter. See Malcolm Gladwell's book OUTLIERS for an eye-opening analysis of the effect of age cut-offs on competition among children. Not a great outcome, it seems to me. Wed, Feb 8, 2012 : 10:32 p.m. Wealthier families are the ones who stay home? Huh? How do you know that to be true? It's families that sacrifice so that one parent can stay home. Wed, Feb 8, 2012 : 2:14 p.m.
With many moms and dads working the kids go to All Day kindergarten or day care, I would prefer All Day Kindergarten! Its about time the schools try to meet the needs of their customers! Thu, Feb 9, 2012 : 6:53 p.m.
@Nicole - Kindergarten remains completely optional in Michigan. You don't need to send your child at all. And you are completely free to arrange for half-day kindergarten at any school-of-choice, private or charter school that offers it if you don't like the AAPS program at your home school. Fine. But don't force me to send my kid all day, if I don't want to or need to. Thank you. Wed, Feb 8, 2012 : 9:40 p.m.
xmo that sounds very unlike you. I would have thought you would have said that our tax dollar shouldn't go to pay for someone else's daycare. &quot;customers&quot;? The word &quot;customer&quot; shouldn't be used when you have single payer single provider services. Wed, Feb 8, 2012 : 2:08 p.m.
As the son of kindergarten teacher in a half day program, I have heard both arguments. She has discussed how some kids are tired in a half day program and how would they respond to all day classes?? But she also sees the children that leave her classroom and do nothing the rest of the day fall farther and farther behind the ones with additional structured programs. As a family with two working parents, I firmly believe my child would be better off in an all day kindergarten program than a half day program followed by childcare. Full day kindergarten offers the benefits of having continuity with the same teacher all day and the continued development in all types of social situations with a smaller group of children. However, I do believe Ann Arbor Public Schools will make this decision based on finances. I just hope AAPS consider the kids and remember that they are the most important asset of the school district. Wed, Feb 8, 2012 : 1:53 p.m. I do not think this is being pushed by parents with children in daycare. I'm one of those parent and I prefer the flexibility of half-day. This is also not being pushed by school districts - they would prefer the status quo, where they receive full per pupil funding for half-day students. The school districts are responding to Lansing's push to cut funding for half day kindergarten. Wed, Feb 8, 2012 : 1:29 p.m. The big push for all day kindergarten comes from parents wanting to cut daycare costs and school districts trying to get more state funding. It has no educational value. Thu, Feb 9, 2012 : 2:45 a.m. I would disagree with the fact that schools are looking to get more money. They currently get full money for a student that is in the school half the day. So, the state is trying to trim and give less money for students only getting half the days instruction and time from the school. Wed, Feb 8, 2012 : 1:36 p.m. I am a proponent for all day kindergarten. But I will admit it is more for convenience and continuity than education. Kids now have to go from kindergarten to after care or a childcare. I do not buy the argument that it will make ANY difference in the &quot;readiness&quot; for college or even high school. Wed, Feb 8, 2012 : 1:11 p.m.
We don't need to send kids to all-day school at age 4 + 9 months. Sure the kid might be a little prodigy, but the chance of being ready for kindergarten are slim. Change the cutoff date to something realistic like May 31, then put them in all day kindergarten. My older daughter has a July birthday, and in another state we were told she was &quot;on the young side&quot;. Our younger daughter has a late November birthday and by Michigan standards we &quot;held her back&quot; so she did not start school until she was 5. Some of her classmates are a full year younger, and even in high school you can tell. Wed, Feb 8, 2012 : 9:57 p.m.
UM_Librarian After reading this post and your other one up above, it sounds like you felt like you had no choice about whether to send your daughter or not. Although it sounds like it is working out fine for her, for many others it doesn't turn out that way, as I have evidenced watching some of the kids at my son's school grow from K on up. Perhaps what the district should consider is expanding the young 5's program to an all day program. This would allow working families to choose the most appropriate start time for their child instead of having to choose based on family budget. All kids are different and some might still choose to start at 4, but at least there would be the choice. Too bad some do not understand reality! Wed, Feb 8, 2012 : 6:39 p.m.
My daughter has a September birthday, and started K this year at 4. She's one of the younger kids in her class, but if I had made the CHOICE to &quot;hold her back&quot; I would have faced an entire extra year of daycare or preschool fees, since I don't have the option of staying home with her. And she's doing great. She loves school. We have not seen any massive pressure for the kindergartners do try anything that's not age appropriate -- she's learning her letters and beginning reading skills, counting to 100, and all the other things we all expect of five-year-olds. Some kids are ready for kindergarten at five and some aren't, but the reality is that as a working parent -- by necessity, not choice -- having access all-day kindergarten is a benefit to my family and many others in this area. Whether she was ready or not -- and fortunately, she was, and is thriving -- she would have started kindergarten this fall. Because that's reality. Not ideal, but real. Wed, Feb 8, 2012 : 6:16 p.m.
Amen Basic Bob! We have the same situation. Wed, Feb 8, 2012 : 1:22 p.m.
&quot;Some of her classmates are a full year younger, and even in high school you can tell.&quot; That is NOT reality! Wed, Feb 8, 2012 : 1:10 p.m. While I believe it would be great if children could stay home with mom or dad more. The reality is most kids if not in all day kindergarten will be with someone other than a parent the rest of the day. A CHOICE, Bob? I am a single mom working full-time outside my home, as well as doing part-time freelancing at home to pay the bills. That IS my reality. I would love to have the CHOICE to stay home with my kindergartner, to have her in a half-day program and spend the rest of the day doing wonderful interactive educational activities with her, but since instead I've CHOSEN to put a roof over my kids' heads and food in their bellies, I'm glad we're in a neighborhood with an all-day kindergarten program. I don't have to worry about making childcare arrangements for part of the day, and my kindergartner and 3rd grader are on the same schedule. She no more tired at the end of the day then she would be if she had to transition from school to daycare or viceversa, and she's getting three recesses, music twice a week, gym twice a week, art, and library -- things she didn't have in daycare. All-day kindergarten may not be ideal, but it is the reality most schools are moving towards. Wed, Feb 8, 2012 : 1:20 p.m. Basic Bob WHAT? If I make a CHOICE to help elect Pres Obama. Is not the REALITY he is President? If I make a CHOICE to buy a Ford. Is not the REALITY I own a ford? Wed, Feb 8, 2012 : 1:14 p.m.
That is a choice people make, not reality. There are plenty of studies that indicate that all-day kindergarten creates more problems than benefits for children. Everyone points to Finland as being the world's leader in education, with their students scoring higher than any other industrialized nation on standardized tests (PISA) in reading, math, and science. Yet they don't introduce their children to classroom learning until the age of 7. Instead Finns approach childhood as a time of play and exploration. In America our children continue to be forced into an assembly-line approach to learning and the results, especially for a nation that had prided itself on innovation, are frightening. Please note that the Rand student quoted by a previous poster even states that full-day kindergarten does not have any long-term benefits and may actually be detrimental in some critical areas. And why is AnnArbor.com continuing to use flawed data to support this reporting? Their calculations are just plain off. Wed, Feb 8, 2012 : 1:08 p.m.
@ pbspirit You really need to tell the WHOLE story! When you can replicate the WHOLE picture in Finland we can do a comparison. <a href="http://www.women-employment.lt/finland.htm" rel='nofollow'>http://www.women-employment.lt/finland.htm</a> Combining work and family In order for equality to become a reality, men and women must be given equal opportunities to participate in political decision-making and working life. In Finland this is furthered through the day-care system, services for the elderly, and provision of school meals. Although a growing number of mothers of small children are working outside the home in Finland, the mothers are free to stay at home to look after their children and receive financial support as an alternative to their subjective right to take their children to a local day-care centre. In Finland a relatively low percentage of employed women with children have part-time work, whereas in most other EU countries it seems to be difficult for employed women to combine full-time working with raising a family. The fact that the birth rate has remained fairly high in Finland testifies to the efficiency of the small children's day care system in Finland. In contrast, the traditionally high birth rates in Southern European countries, where less attention has been paid for example to the public care system, have fallen bellow the rates in the Nordic countries. However, the overall birth rate is declining in Finland as it is elsewhere in Europe. Much has been done to involve men in child care. So far only little success has been achieved. It is encouraging, however, that fathers have started to participate actively in childbirth training, and that already over half of all fathers take paternity leave. Special measures are needed to increase the popularity of parental leaves among fathers. Wed, Feb 8, 2012 : 12:32 p.m. I'm hesitant to move to an all day model; I ask every kindergarten teacher I meet what they think about this, and the vast majority don't support it because they're still little kids and only five years old. Many don't require the structured work environment of school, and it's physically tiring for their little minds and bodies to take the stress of school all day. They'll spend the rest of their lives in a highly structured environment, and parents in Ann Arbor push their little ones to do so many lessons, classes, and teams already. I say let them be little kids for the other half of the day. Fri, Feb 10, 2012 : 8:15 p.m.
My son has been in daycare since he was 2.5 years old and he has blossomed and has tons of energy every evening. He is perfectly set for kindergarten. If this doesn't go through, we now have the choice of 1/2 or full day but I would send him to full day to get the BEST educational and social experience possible. I don't think you are giving the kids credit for what they can do. Thu, Feb 9, 2012 : 2:24 a.m. If both parents work, the kids are used to it anyway. Heck our girls were in day care as babies. Wed, Feb 8, 2012 : 9:37 p.m.
UM-Librarian, Sorry if I seemed flippant, it was not my intention. I have several friends who had early fall birthday children and were on the fence about whether to send them or not. These were all dual working families. We also go to one of the all day K schools in AA. The thing that tipped it for all of them was that they would have to pay for day care for an extra year if they held them back. They could afford the daycare, but of course, would prefer not to pay for it. I understand the choice is probably not fun to make. But I stand by my position that I don't think the parent of a 4 year old should have the choice yet. You should need to be 5 to enter Kindergarten, especially since everything they do today in K is what most of us did at 6 in first grade. The times have changed. Now if they want to make a 4 year old all day preK with goals appropriate for a preschooler, I could get behind that. Wed, Feb 8, 2012 : 7:36 p.m.
Dear aamom, I know a few parents who have chosen to hold their kids back, but in most cases those that do not aren't doing it &quot;for the free daycare&quot; as you so flippantly assume, but because they are in neighborhoods or districts where all-day is the norm. I will admit that it makes my life a lot easier, but I also don't have the option to stay home all day with my children. Not having the worry about transportation to and from daycare, the extra costs involves, as well as the consistency my daughter receives instead of two or three changes of care during the day, has only helped our family life. Don't flippantly assume parents who send their 4 or young 5yos to school are trying to take advantage of the system somehow. I wish I had the choice. I don't. This is why more and more people are holding their kids back. Most of what is asked of a 4 year old in Kindergarten is not age appropriate developmentally. I think the cut off date should at least be changed to Sept. 1st instead of December. Most 4 year olds do not belong in full day kindergarten. Most are there for the free daycare, not because their parents think they are prodigies who should be starting full day school early. This would also have the added benefit that the almighty test scores would most likely go up if the kids were older and more ready to learn the information. Wed, Feb 8, 2012 : 1:35 p.m.
What are these kids doing the other half of the day? Are they going home to read with mom or dad, or are they going to some after school program that is run by professional educators? If we are going to use the excuse that they are tired you are basically just prolonging that till they are in 1st grade. The academic expectations are rising, it seems that getting kids started as early as 5 years old can only benefit them in the long run. Wed, Feb 8, 2012 : 12:19 p.m.
Utterly pointless. Like an extra half day when you were 5 years old means a thing when you're heading off to college. Actually it does...if you look at any research discussing the importance of quality early childhood learning experiences, research shows that children who do not go to preschool or do not have quality early childhood learning experiences are more likely to drop out of high school (forget going to college) ; have a higher chance of being a teen parent; go to jail, etc. Although I do not have a specific link at my fingertips, go to any educational database (i.e.ERIC) and look up the Perry/High Scope longitudinal study. I think all day K for EVERY child is long overdue. While I also do not think it makes much difference if you spend another half day in kindergarten in the long run. WHERE do you think most of those 1/2 day kindergartener's spend the rest of their day? Not with a parent in most cases. Wed, Feb 8, 2012 : 12:13 p.m. Seems like a no brainer to me. Kids are asked to do so much more academically now then in the past. We need to get these kids in school all day to begin that early academic push. Clearly most of us probably went to 1/2 Kindergarten, but times are changing and kids can benefit from the academics and structure of an all day classroom setting. The other aspect to consider is bussing, what will we save by not having to make runs at noon everyday for these 1/2 day students. Wed, Feb 8, 2012 : 11:57 a.m. Wed, Feb 8, 2012 : 1:48 p.m.
&quot;Currently, 21-23% of all children nationwide end up as functional illiterates as adults&quot; And you thinks THIS is the fault of half day kindergarten ? It appears that is what you are implying. Wed, Feb 8, 2012 : 12:25 p.m. Wed, Feb 8, 2012 : 11:36 a.m. It makes sense to have all day kindergarten -- saves on busing.